The ZSU-23-4 entered service in 1966, as a replacement for the much less effective ZSU-57-2. The ZSU-57-2 mounted a pair of 57mm autocannons in an open-topped turret. 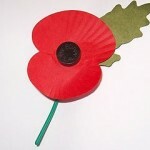 Lacking a radar, it was a clear-weather system, only able to engage targets that the operator could see. The open-topped turret left the crew vulnerable to artillery fire, and there was no NBC protection. The new system’s 23mm autocannons are much smaller, leading to a shorter effective range. However, the combination of four barrels instead of two, and the very high rate of fire, greatly increases the probability of a hit. 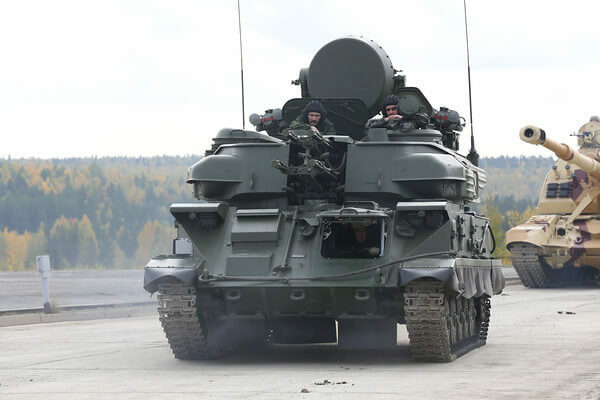 It is fitted with a radar, NBC protection and a fully enclosed turret, thus addressing the major limitations of the earlier vehicle. It also has infra-red night-fighting equipment, but unusually for Soviet AFVs, lacks an amphibious capability. It was the standard self-propelled AA gun throughout the Warsaw Pact, and has been widely exported elsewhere. In 1982, the 2S6 Tunguska started to replace it in Soviet service, but some Shilkas are still in service with the Russian army, and variants are still being produced for export. 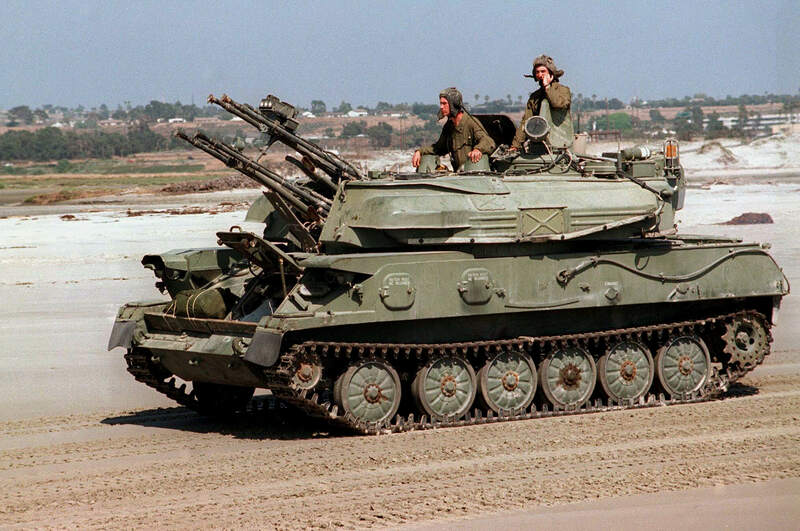 The ZSU-23-4 has seen service in the middle east, during the 1973 Yom Kippur War, the Iran-Iraq war in the 1980s, and the 1990 Gulf War. During the Soviet invasion and subsequent occupation of Afghanistan, it was used in a ground support role. The high elevation capability was found to be extremely useful in the mountainous terrain. During the urban fighting in Grozny in 1995, it was used in a ground support role once more, its high elevation useful for reaching tall buildings. Unfortunately, its thin armour made it vulnerable at the short ranges characterised by fighting in a built-up area, issues which led to the development of the BMPT and BMPT-2. The chassis is based on a modified ASU-85, and it has an enclosed turret holding four water-cooled 2A7 23mm guns (the gun mounting is designated AZP-23). The four autocannons are fed from seperate belts, and so can theoretically each fire different ammunition. In practice, however, the normal load for each belt is three OFZT incendiary fragmentation rounds followed by one BZT armour-piercing tracer round. A Gun Dish radar is fitted for acquisition and tracking, connected to an analogue computer for fire control. The radar can acquire targets at ranges of up to 20km, and track them at ranges up to 18km. Backup optical sights are also fitted, for use in heavy ECM environments. The crew of four consists of driver, radar operator, gunner, and commander. The driver’s compartment is in the front, with the other three crew members in the large central turret. The engine compartment is at the rear of the vehicle. The large number of electronic vacuum tubes in the ZSU-23-4 fire-control computer generate a great deal of heat, which caused problems with cooling. In 1966, the ZSU-23-4V entered service, which had changes to the venting covers and removed the heat exchanger from the turret roof. In 1970, the ZSU-23-4V1 was introduced. This had an improved computer, and ventilation system cases at the front of the turret. 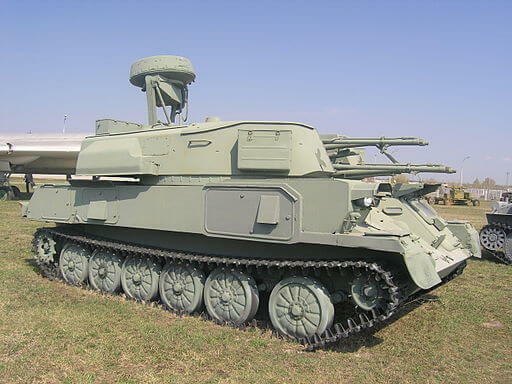 The ZSU-23-4M, introduced in 1973, had further cooling improvements and enhanced ECCM. From 1977, vehicles were fitted with an improved IFF system and designated ZSU-23-4MZ. This IFF system was retro-fitted to existing ZSU-23-4M systems.